Counting the Shapes. Yoon Ha Lee. Fantasy with a mathematical bent – in fact, fantasy with magic with a mathematical bent. A female mathemagician, a long-lost son, a dark, evil enemy – an almost perfect recipe for bog-standard fantasy phare. Fortunately, Yoon Ha Lee handles the story elements quite deftly and manages to create a successful story out of these ingredients. The Diamond Pit. Jack Dann. 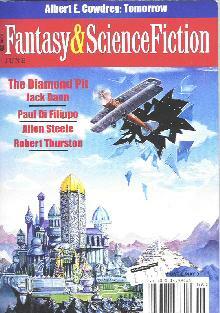 In recent reviews I have mentioned the large number of short stories in F&SF, and for me we have a welcome change with this issue, as the story count is down to five (half the usual) and in this story we have a most substantial novella. Dann shows that a good author does not have to resort to time travel nonsense to write a period piece, and his 1920s-set adventure story is quite authentic in tone and style. An aviator crash lands and comes to in a mysterious cell. As more of his surroundings and circumstances are made clear, the mystery in fact deepens. A mountain made of diamonds is but one piece of the jigsaw. Not absolutely without its flaws – some of the characterisations are a little two dimensional (although this may be a consequence of taking on the 1920s feel too well!). A refreshing change. Mind you I should point out that I was reading this story in Maximilian’s bar in Amsterdam, sipping their Trippel, brewed on the premises, so I was probably in the best possible mood to read a story. A fairly straightforward tale of ancient XXXXXXX. And once you work out what the morrow will bring, the story has served its purpose. Tom Swift and His Humongous Mechanical Dude. Allen Steele. A most bodacoius tale, very much in the style of the filmic Bill and Ted’s Excellent Adventure. If you live in Squaresville you will probably find the story unpalatable. The World’s Light Heavyweight Champion in Nineteen Twenty-Something. Unlike Dann, Thurston does resort to a time travel trope, which is a bit of a shame as without it you would have a very well wrought piece of mainstream fiction portraying a few characters connected to a boxing promotion in the 1920s. To my mind a pretty good balance – one substantial story and four smaller ones. A mighty fine read.